After a long day of farm visits in Santa Cruz, CA, we sat on the cliff with sandwiches soaking up the salty coastal air as the fourth day of our Food Justice Tour came to a close. As with every day, this one was filled with intensely political and intellectual conversation, insightful questions and meaningful exchanges with the group of 13 Basque farmers and food activists I had the honor of traveling with. 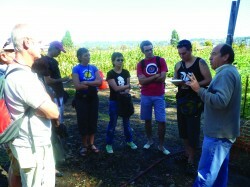 Since its founding in 2010, Food First’s Food Sovereignty Tours program has led two trips to the Basque Country, where farmers’ union EHNE-Bizkaia has taught us about their unique history, culture, food traditions and innovative work advancing food sovereignty (See “Food Sovereignty in Practice in the Basque Country” Food First Backgrounder, Fall 2013). 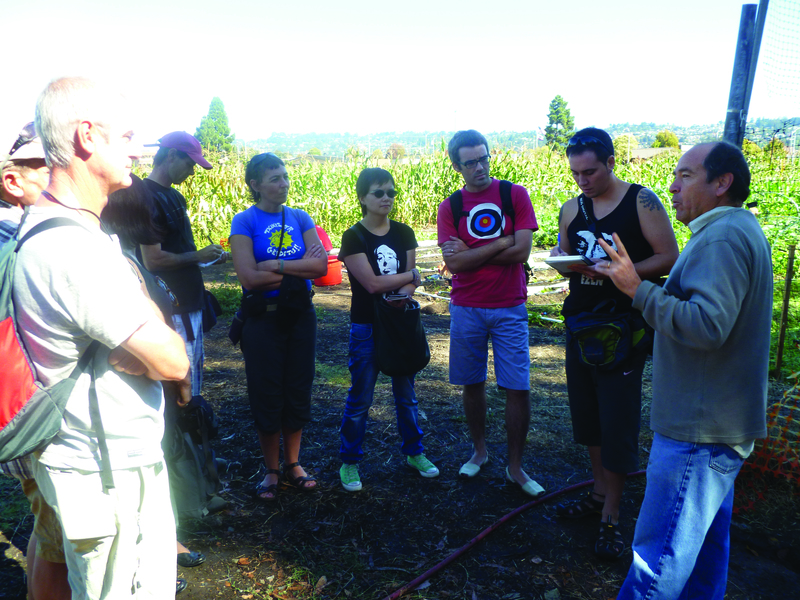 This September, we had the opportunity to invite our Basque partners to learn about food justice in the San Francisco Bay Area. We began in Oakland where we met David Hilliard, former Chief of Staff of the Black Panthers, who helped us trace the roots of food justice and the city’s social movement history. We visited People’s Grocery and Dig Deep farms, farmers’ markets, and business incubator programs La Cocina and the Agriculture and Land-Based Training Association (ALBA). We talked about agroecology with professors Miguel Altieri and Clara Nicholls at the University of California Berkeley; movement-building with Gerardo Marin of Rooted in Community; and public organic waste processing with Andy Schnieder at the City of Berkeley waste transfer site. We visited Swanton Berry farm one morning; spent the afternoon at the Center for Agroecology & Sustainable Food Systems (CASFS) chatting with farm apprentices about their training program; and finished the day at Life Lab learning about garden-based education. After most of the visits our hosts would pull me aside and tell me that this group had some of the best questions and was the most curious of any group they had ever hosted. As we sat in the chilly coastal wind one night, we watched three members of our Basque group brave the California waves, eager to seize every possible moment to experience the Golden State in our six short, but densely packed, days together. I was inspired by the Basques’ depth of analysis and commitment to food sovereignty, but also impressed with their ability to have fun—and sing!—along the way.know how to laugh and find fun along the way.